Don’t just take my word as to how great this place is – Jay Raynor of the Grauniad also thought it pretty damn good when he reviewed it. Not unusually for me, I am going to start this post at somewhat of a tangent. Bear with me though, as there is method in my madness. I am not a huge fan of Jamie Oliver. His Italian is overpriced and the food distinctly average (based on my one and only visit). Also if he believes so passionately that sugary soft drinks are so bad (I don’t disagree with the premise that they are) why sell them at all (let alone on, I suspect, a very profitable basis – £2.65 for 330ml of coke represents one hell of a mark up with only 10p of that the charity tax) in his restaurants. Isn’t selling the “evil” stuff, but adding a “voluntary” tax to the price, akin to ASH running charity shops which sell, amongst other things, cigarettes and justifying it by popping on a small extra mark up on the price of the ciggies and donating it to the NHS (but keeping a sizeable profit from said sale)? Smacks of “do as I say, not as I do”. Anyhow (I am only jealous) and the reason for referring to Jamie Oliver is that one of the very good things he has done (with Fifteen for example) has resulted in an increasing and pleasing awareness of the benefits of exposing students to the rigours of real life working environments, with catering being an area particularly suited to this. 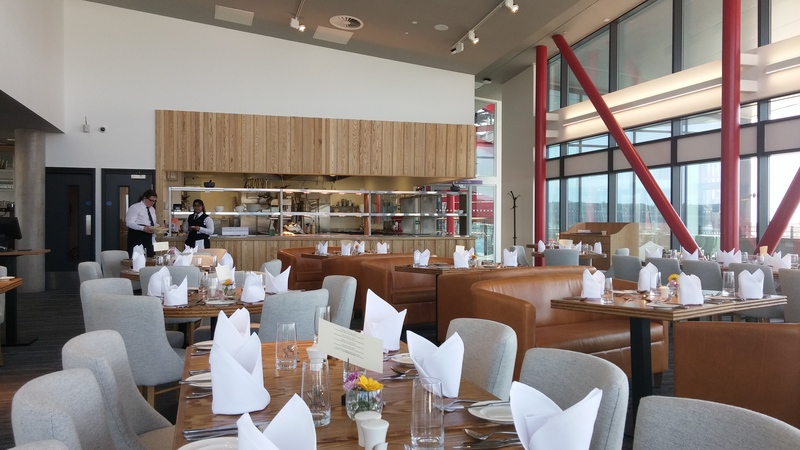 There is no better way to prepare for the rigours of everyday working life in that industry than having to serve up, as part of the kitchen or front of house crew, food to paying customers. These are people who expect something good in return for their hard earned cash. Inside it is a very pleasant, light and airy space. A nice dining environment I thought. I particularly like the open kitchen as I love watching chefs at work – find it utterly fascinating. 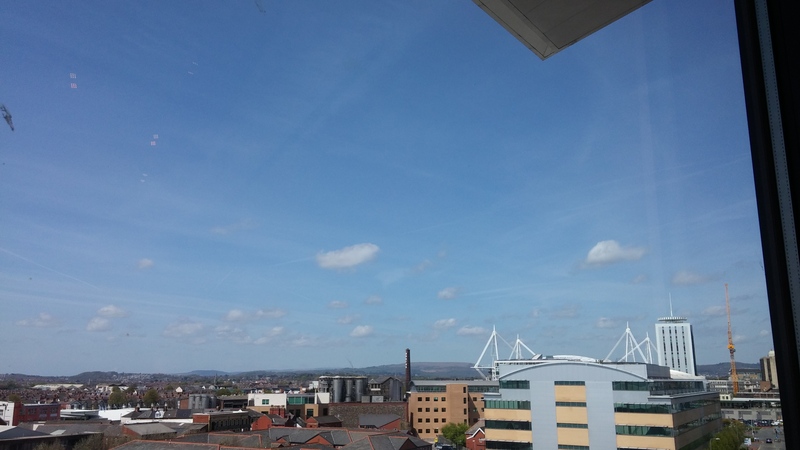 Sat atop the College’s new campus building it has panoramic views of Cardiff (best to look up rather than down for the more scenic aspects of the view). 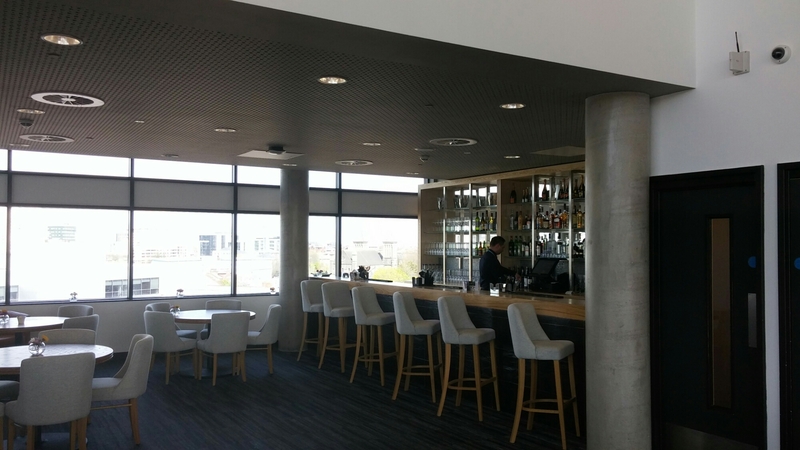 There is also a very nice looking bar area for an aperitif before your meal. 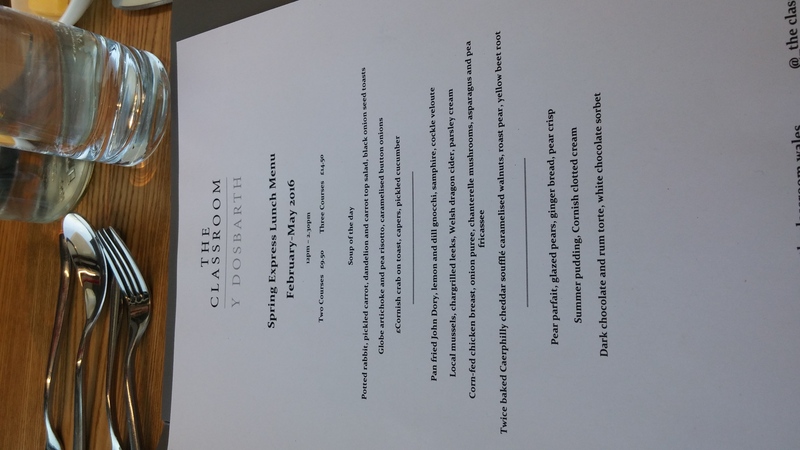 The lunch menu, at £9.50 for two courses and £14.50 for three, is populated with stuff that you would expect to see on the al a carte menu of a top end restaurant. It all sounded lovely on paper and J and I ordered with much anticipation and whetted appetites. Despite the bargain price, the ingredients used are not cheap here. 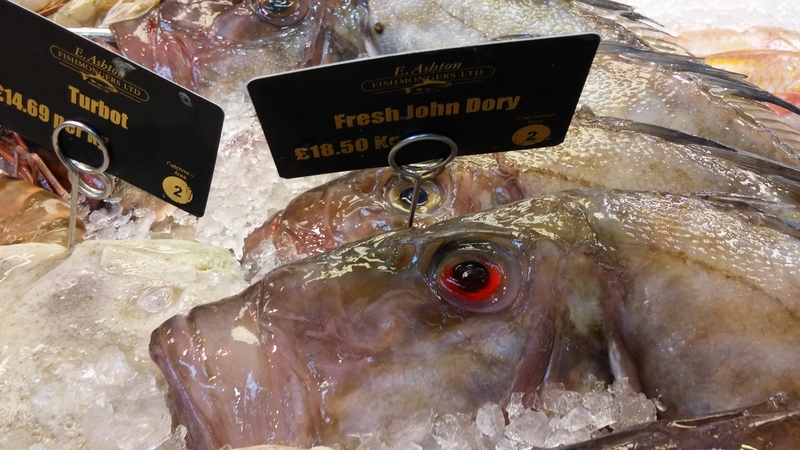 For example, John Dory (Iast time l looked) goes for £18 plus a kilo. This makes it, at least on paper, even more impressive value. 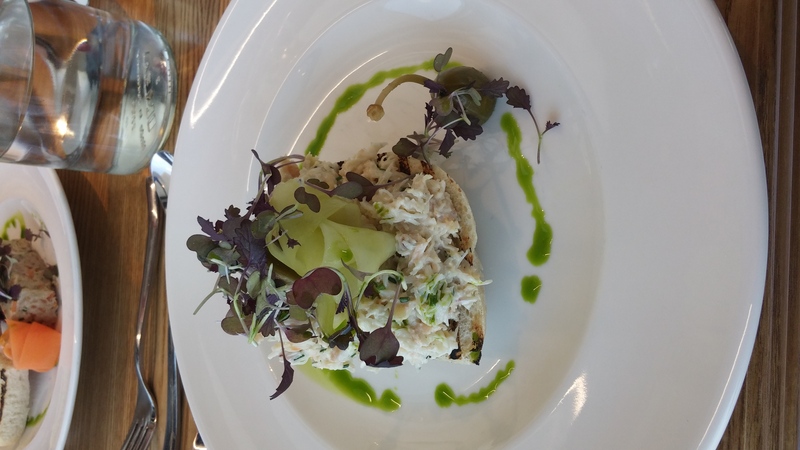 After a bit of indecision I plumped for the Cornish crab on toast for starter and J the potted rabbit. I absolutely love crab, preferring its flavour to that of its more expensive cousin the lobster. On it arriving it certainly was a good looking dish and a very decent size portion for a starter on a fixed price menu. Sensibly they let the crab do all the talking flavour wise with little added to it. No mucking about here being clever, just respect for a top quality ingredient in the form of the crab, with a very light touch on the dressing and some herbs running through it. The addition of lightly pickled cucumber ribbons and some tart caper berries worked really well with the fresh sweetness of the crab meat and made for a very refreshing dish. The nicely charred toast and subtly dressed salad finished off beautifully a dish that was as pretty as a picture and tasted as good as it looked. The size of the portion would have done me for lunch normally on its own. 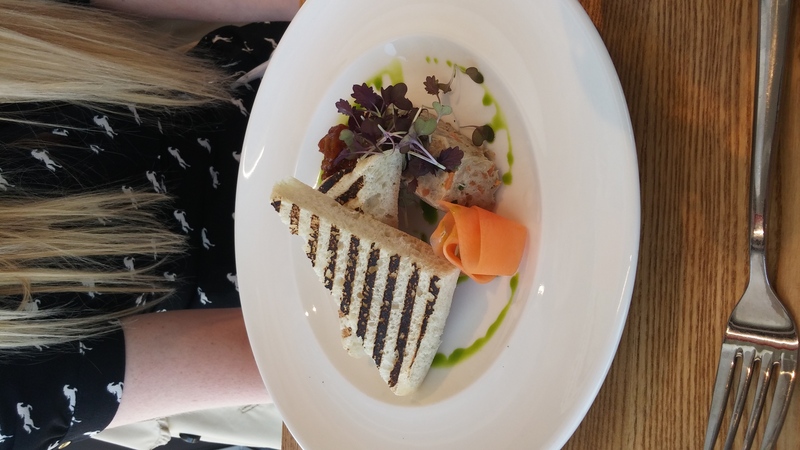 J went for the potted rabbit, with a dandelion and carrot top salad and black onion seed bread. This was a beautifully presented dish and also delivered on the flavour front. Moist, flavoursome rabbit (tricky to cook rabbit, as it can be dry if not treated properly) with the intriguing addition of dandelion and carrot tops. It is fair to say that J virtually inhaled this. It came with some nicely pickled carrot and a punchy chutney. The salad of dandelion and carrot tops was according to J pleasant and nicely dressed – all fresh as a daisy (rather than a dandelion). I nodded with approval at the very decent portion of toasted bread it came with (hate it when restaurants don’t give you enough with pâté, terrines etc.). My only slight issue with the terrine (from the taste I had) was it could have done with just a smidgen more seasoning, but I am a bit of a salt fiend and J pointed out that this was resolved when the rabbit was combined with the accompanying chutney. Again a very decent portion size for a starter. 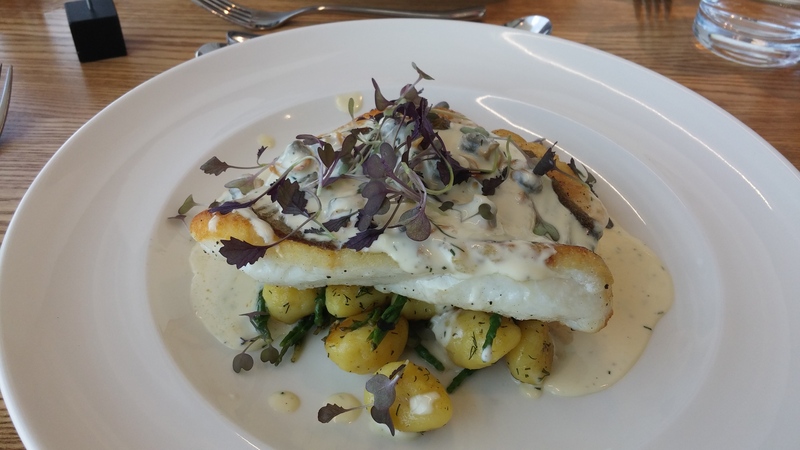 On to the mains, I ordered the John Dory fillet, with a cockle veloute, samphire and gnocchi. This was an absolute crackerjacker of a dish. The huge hunk of fish (did I get lucky or is this the normal portion size I wonder) was perfectly cooked and sat atop lovely light and fluffy lemon and dill infused gnocchi and crunchy samphire. All this was topped off with a velvety fish veloute and a sprinkling of juicy briney cockles. A taste of the sea, if every there was one, this dish. I would have very happily paid £18+ for it. Again a beautifully presented dish that tasted as good as it looked. The corn fed chicken was lovely and tender with a flavour that only a happy rather than battery bird has. The sauce was rich and silky and packed full of flavour. We thought there may have been the addition of Masala wine to it? Vegetables were cooked the right side of al dente, bar from a lovely (unadvertised) potato cake that brought a welcome bit of starch to the proceeding. Cameralised on top it was buttery, but light and downright delicious. Only slight quibble was the mushrooms (or at least ones on J’s plate I saw) didn’t look or taste like chanterelles to me (looked like enoki mushrooms – nice enough but not a patch on a chanterelle – perhaps J scoffed them before offering me a taste). Wine is clearly an important component of the food offering here as they are doing a load of fine looking wine dinner events over the course of the year. Regrettably I didnt get sight of the wine list, so am unable to comment on its content. Hopefully it follows the food offering in terms of quality and price. 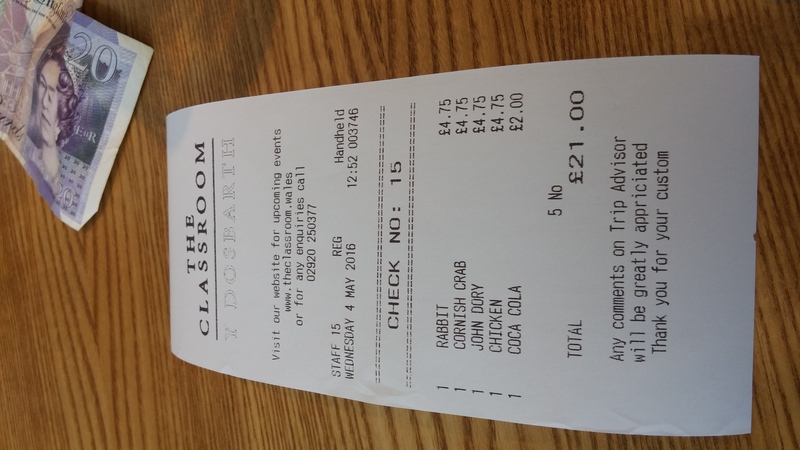 The total bill for our 2 × 2 (really top notch and very substantial) courses was £21 (inc my coke, but ex. tip which was given). Yep, you read that right – £21! Services was friendly (a little nervous perhaps – but all part of the learning exercise) and deserving of the tip given (as was the food). For the quality of what we were given this has to be one of the (if not the) best value lunches currently available in Cardiff. If there is a better offer around for food of this quality (I very much doubt it) then I want to know about it. Would I go back? Fabulous food at a bargain fixed price – you betcha. I have tried to go back already, but they were fully booked. Bad news for me, but great for them. It’s a couple of minutes walk from the back of Cardiff Central Railway Station. Where the restaurant is, is not that apparent when you enter the foyer area if the building it sits within. We just asked at reception and they pointed us to the lift and the 5th floor. 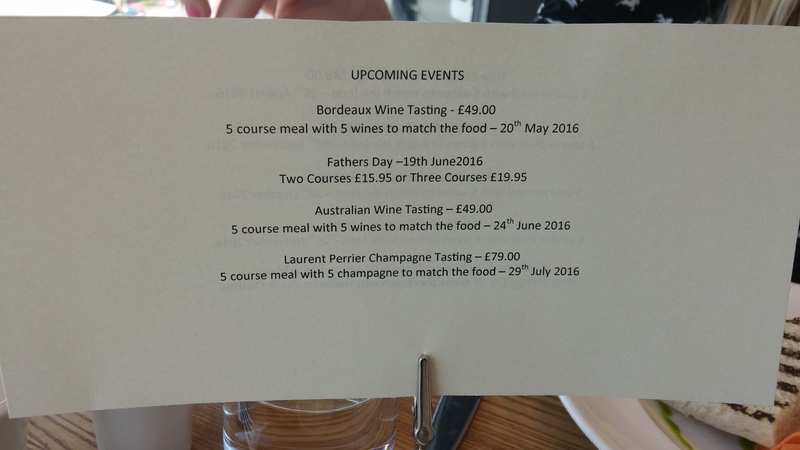 Various wine dinner and guest chef events occur thought the year with details on their website – all look good (in terms of what’s on offer and price). 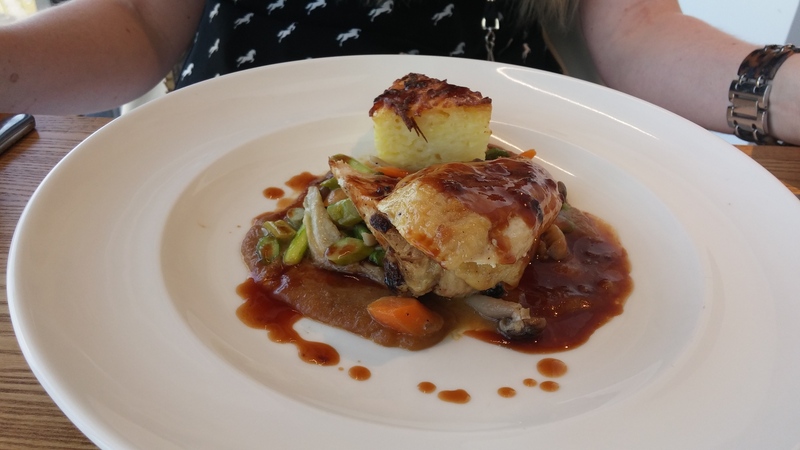 This entry was posted on May 15, 2016 by solicitingflavours in Cardiff, Cardiff and Vale College, Cardiff restaurant, Drink, Fine dining, fish, Fixed Price Menu, Food, lunch, lunchtime, New restaurant Cardiff, Non alcoholic drink, Red Wine, Restaurant Review, review, seafood, The Classroom, White wine, wine.